WHERE: CNBC’s “Closing Bell” – Live from Washington D.C.
WILFRED FROST: To begin with, let’s get to Sara Eisen and her exclusive interview with Fed Vice Chair Rich Clarida. Sara, over to you. SARA EISEN: So, let’s start out where we are in terms of U.S. growth, which has slowed down a little bit this year. What is the outlook? SARA EISEN: --that’s happening around the world. And one big question is how much that effects us and spills over into the U.S. How do you think about that? RICHARD CLARIDA: And you know, Sara, there is an effect, through several channels. One, when the global economy slows, our exports tend to slow down. And we see that. Also, as you know, the U.S. is part of a global financial market, and so, if there’s uncertainty abroad, that tends to spill over to our markets as well. So, it is a factor. You bet. RICHARD CLARIDA: You know, I’m not sure. You know, this expansion -- in July, it will be a ten year plus expansion. The longest in U.S. history. And so perhaps people are conditioned to thinking as these things go on, there is more of that risk. But, you know, Sara, we don’t see it. We don’t see an elevated recession risk. There are a lot of different indicators. You know, they move up and down. But as I said, the economy is in a good place. RICHARD CLARIDA: Well certainly, as I mentioned, 2018 was the strongest year for growth in a decade. The tax cuts are on the books now. They certainly had a positive effect on the economy last year. And I think it’s too soon to tell how big an effect they will have. But it has been a positive. RICHARD CLARIDA: I haven’t really seen estimate of that. I guess my sense is probably not a lot. I think there are other factors. I think that’s more things that people worry about that could be a problem. But I don’t think so far it’s been an issue. RICHARD CLARIDA: I don’t think that I’ll use that term. But what I would say, when you look at the data, Sara, that the macro data globally has surprising on the downside now for about a year. So, if you rewind the clock to a year ago when you were here, there was a lot of optimism. I think now perhaps the expectations are more in line with the data and there is some prospect for an upturn in global growth later in the year. SARA EISEN: You’re sounding very positive to me. SARA EISEN: On global growth, on U.S. growth, and yet the Fed has made a big reversal. You’re patient, you’re on pause. I mean, it seems like a big U-turn and the market has certainly responded. RICHARD CLARIDA: Well, I wouldn’t characterize it that way. What we’ve said is that we can afford to be patient because we’re really operating very close to our goals of maximum employment and price stability. You know, there has been a lot of rate normalization that been done under both Chair Yellen and Chair Powell. And we think that it is appropriate now to be patient and step back and see how the data evolves. And so, as I said, the economy is in a good place and I think monetary policy is in a good place. RICHARD CLARIDA: Yeah. Well, what I would say about that is, markets – as you know, you’re a pro – markets go up and down and we don’t want to be handcuffed you know, to the daily moves. But we, of course, look broadly at equities and credit spreads and volatility in a lot of markets. But I think the markets are really reflecting the fact that the underlying, you know, momentum in the economy is good. And, as I’ve said, you know, we think the economy is in a good place. So, I guess markets also see that. RICHARD CLARIDA: I don’t think that it was a mistake. I voted for it at the time. If I could rewind it, I wouldn’t change that view. I think the December hike was justified given where the economy was and also justified given that it was important for us to get the policy rate in the range of what we’ve called neutral. And as Chair Powell has indicated and I’ve said in my speeches, the policy rate is in the range of neutral and when you’re neutral, you can afford to be patient. You know, a year ago we weren’t. We were below neutral. RICHARD CLARIDA: I’ve heard that and thank you for reminding me. I’d say a couple of points. On the balance sheet-- the balance sheet is something that we’ve been discussing both publicly and in the committee really several meetings last year and this year. And we were always going to make a decision on the balancing sheet and we made that decision this year after a lot of deliberation. And I think we’ve communicated it well. Obviously, QE was on try going in, and there is not a playbook for coming out, so there was probably some market uncertainty about that. And we’ve resolved that, I think, appropriately. But, as I said, I think we’re in a good place and I think in terms of responding to markets, you know, a lot of folks weren’t saying that in December when folks were calling for us to pause. So, I think we just – Sara, we just put the monetary policy in place that has the best chance of achieving our goals on a sustained basis. And that is really what we’re all about. RICHARD CLARIDA: Well, I think one of the virtues of having the act to be patient is that you just let the data to come in. We don’t see a need now for a move in either direction. You know, we’ll be getting more data. We had some issues in terms of the shutdown, in terms of getting data late. And so, it’s going to take time to assess all that. We’ll get Q1 GDP pretty soon so we’re looking at all of that. SARA EISEN: It’s tracking around 2% now, according to the Atlanta Fed. RICHARD CLARIDA: Yep. Yep. It definitely has been perking up from some of the earlier tracking estimates. So, I don’t think that I’d characterize it in terms of a bar other than just to repeat myself and say that we’re in a good place. RICHARD CLARIDA: That’s a great point, because as you know, we have a dual mandate. And the fact is, is that inflation, for most of the past seven years, has been somewhat below our 2% objective. And indeed, last year with 3% growth and a 50-year low in the unemployment rate, core inflation was 1.9%. I think there are a lot of factors. I think globalization is a factor. In some ways, Sara, I think the fact that we and other Central Banks have been successful at keeping inflation low and stable, you know, makes it perhaps more difficult to get inflation up than it may have been in the past. So, we’re looking at all of those factors. And we do think that it is important, Chair Powell has said this recently, it is important for us to demonstrate that inflation can get back to 2% and stay there on a sustained basis. RICHARD CLARIDA: Well, you know, there are a lot of opinions about monetary policy. I’m sure they are held in good faith. Monetary policy is more of an art than a science. And so, we respect that folks will have differing views. But again, we have a committee of 17 now, full strength 19, and we make a decision based on the evidence and the data and our analysis of what we need to do to achieve our mandate. RICHARD CLARIDA: Well, let me just say about that: I think market pricing is a little bit tricky to interpret sometimes. And I wouldn’t characterize the probability right now on what we’re going to do. But I’ll just leave it at that. SARA EISEN: I mean, a rate cut happens when you see the outlook deteriorating, or a potential recession. It doesn’t sound like you’re there? RICHARD CLARIDA: I’m certainly not there for a potential recession. Now, if you look back at Fed history-- I’m not looking to the future, if you look back at Fed history, there have been times when the Fed in the ’90s took out some insurance cuts. We saw that in ’95,. We saw that in 1998. So, rate cuts are not always associated with recession. But as I said, we certainly don’t see a recession right now. RICHARD CLARIDA: What I can tell you, Sara, is, you know, that I, my colleagues on the committee, we’re just doing our job. It is a complicated world. Folks will have opinions. We respect that. We’re just doing what we need to be doing. RICHARD CLARIDA: I did attend that dinner. And I will just comment that I enjoyed the opportunity and I’ll leave it at that. We issued a statement after that dinner which I think speaks for itself. So. RICHARD CLARIDA: Well, let me just say very clearly: a decision on who to nominate is up to the President. And confirmation is up to the Senate. And so, I’m not going to weigh in on that. I don’t really know either of them very well. And right now, we have a committee of five governors and of course the Reserve Bank Presidents. And we’ll just focus on that right now. RICHARD CLARIDA: I’ve been there six months. I’ve not seen it around the table. I’ve not seen it, you know, the hallways. You know, we -- the nice thing, Sara, about the way we’re organized is that our mandate is in statute. There is a statute in the law that says we are charged with maximum point of price stability. We have a professional staff that does arm’s length economic analysis. And so, it is pretty easy for us to focus on what we need to do there. And that’s what we’re doing. RICHARD CLARIDA: I think -- I don’t have any comment on that. We can talk about that, you know, after they’ve had their hearings if you want. SARA EISEN: Alright, fine. Let’s talk about the bond market. SARA EISEN: And let’s say we have a sustained yield curve inversion here. How should we read that? RICHARD CLARIDA: Well, okay. So, the yield curve is of course the difference between the ten-year and the short yield. And yield curves can steepen or are flatten for a variety of reasons. I do think that outright persistent prolonged inversions are rare. Certainly, I would pay attention if we had a sustained prolonged inversion of the yield curve. We’re not there yet. We had a brief inversion, it lasted for a couple of days, last week. I think the other thing, Sara, that makes determining the yield curve a little bit more tricky now is the fact that because of global developments, the term premium, and that is the extra yield investors require to hold a ten-year bond, has been moving around a lot. And in particular, by most estimates, in negative territory now. That means bond yields are being depressed because of a desire to hold safe assets and not just about our policy path. And so, at the Fed, we would have to try to educate ourselves if we did get a sustained inversion, if that is due to some information about the economy or our policy, or if it is reflecting other factors in the global bond market. So, it’s a little bit trickier now. RICHARD CLARIDA: And as you know, when I did your show before, we used to talk about that lot. And certainly the U.S. is the center of the global bond market. And what happens in Europe and Asia has a big impact on ten-year bond yields, over and above whatever we’re doing here. 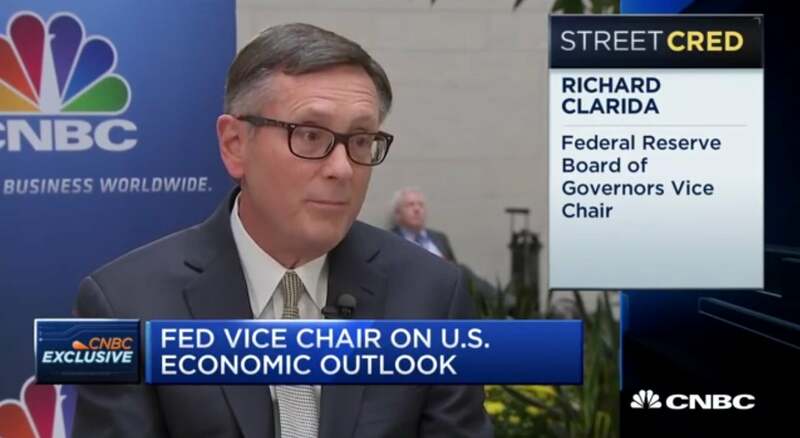 RICHARD CLARIDA: It suggests to me that the economy is in a good place and that the market sees an economy with stable inflation and growth that is solid and doesn’t have any particular view right now about any change from that. Again, with the proviso that bond yields can go up and down for reasons outside of what we’re doing or what is happening in the U.S.
RICHARD CLARIDA: Well, I think, as I said, among the known unknowns, I think that we have a pretty good handle on that. I think the risks are things that you don’t necessarily, you know, have an ability to factor in. And, you know, we’ve gone through several potential risks. I think what I would say is a risk that is one that I think is not a particular concern now is that the global financial system and the global banking system in particular is much better capitalized and has much more liquidity than a decade ago. So, although we can talk about the risk, we also need to reflect some improvements in the financial system as well. RICHARD CLARIDA: Yeah. Well, again, we have yet another extension of the Brexit. And Brexit, of course, as you know—you’ve reported on— there are a lot of possible scenarios there. You know we’ve looked at those. What we can say is that we and Central Banks in other countries that would be affected have been really focused now for some time on making sure that financial institutions are as prepared as they can be for you know, unfortunate outcomes to Brexit. You know, U.S. institutions don’t have a lot of direct exposure relative to their capital right now. And we’re monitoring it very closely, as are other Central Banks in other countries.